The UFC has massive global appeal. Whether it's the fans or the fighters facing off in the Octagon, the brand has a tremendous international reach. 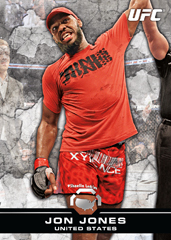 2013 Topps UFC Bloodlines digs a little deeper into what makes it so popular in all corners of the globe. The high-end set packs a hit in every pack with boxes delivering five total autograph cards and a host of memorabilia. 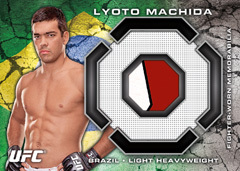 The 2013 Topps UFC Bloodlines base set has 150 cards. All are fighters including several who made their UFC debuts in the months leading up to the set's release. Parallels come in four levels, combining to land one per pack: Flag (#/188), Black (#/88), Ruby Red (#/8) and Platinum (1/1). The Bloodlines name began as an insert before getting its own set. Bloodlines inserts return as a 15-card set. The cards are very bio heavy, containing vital stats and an extensive write-up. Parallels follow the same pattern as the base set except there are no Flag versions. Collectors can also look for autograph dual autograph, relic, jumbo relic and dual relic versions. Octagon-side inserts bring an old-school look as though they were released in the 1950s. Like Bloodlines inserts, there are Black (#/88), Ruby Red (#/8) and Platinum (1/1) parallels. Ten fighters also have autographed versions that are numbered to 50. Fighter Autographs return with a checklist of more than 30 signers. 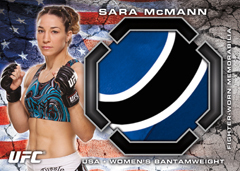 All are numbered and, as with all Topps UFC products of the past few years, first-time signers get a special notation. Red Ink (#/15) versions come signed with the fighter's nickname. Global Championship Conflict (five cards, #/25) have a pair of autographs from fighters who faced off in a championship bout. In the middle of the card is a gold foil belt plate. 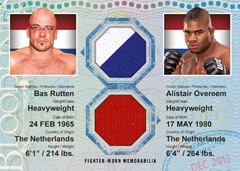 International Air Mail Dual Autographs (five cards, #/25) showcase fighters who had matches outside of the United States. Book cards bring anywhere from four to eight autographs. 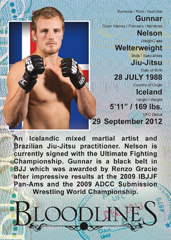 2012 Champions Octograph Book Card is a one-of-one that has signatures from all eight 2012 UFC champions. 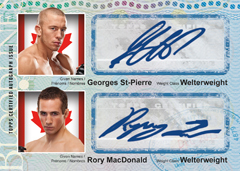 Countrymen Quad Autograph Book Cards (five cards, #/5) highlight four fighters that come from the same country. Fighter Relics come with pieces of fighter-worn shirts and shorts embedded in them. All are numbered and the checklist consists of more than 25 cards. Other relics include Jumbo Fight Mat Relics (#/188) and Fighter Jumbo Relics (#/188). Dual Relics (#/88) pair up fighters who come from similar parts of the world. 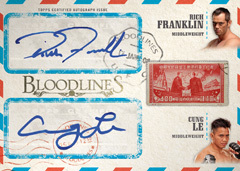 Autographed relics combine to fall two per box in 2013 Topps UFC Bloodlines. Fighter Autographed Relics are the most common, adding a signature to the basic relic card. Fight Mat Jumbo Relics (20 cards, #/25) combine an autograph with a large swatch from a mat used during one of their matches. As the name suggests, Dual Autographed Relic Book Cards (ten cards, #/10) have two autographs and two memorabilia pieces. 2012 Champions Fighter Autograph Relic Book Cards (eight cards, #/3) include two jumbo relic swatches. Sketch cards return in 2013 Topps UFC Bloodlines. Each of the cards feature original artwork drawn directly on the card. Every box includes one commemorative relic. 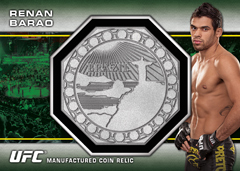 Octagon Coins come with original coins embedded in the cards that showcase where the fighter hails from. Each card is numbered and there are 25 in the set. Gold parallels are numbered to 25. Randomly inserted in 2013 Topps UFC Bloodlines are redemptions good for uncut sheets of base cards and Flag parallels. 2013 Topps UFC Bloodlines Stephen Thompson (# 188) (USA FLAG) Base Parallel!!! 2013 Topps UFC Bloodlines Auto Lot! 5 Cards! Yes. I pulled a Champions Autograph Relic Book card of Jon Jones and it’s machine damaged. Just dropped $1000 on a case & never have felt so ripped off. The setlist is weak at best. I pulled so many prelim fighters. Also, the number of doubles and triples I pulled are a new record and that is including relics and autos!. Chasing the base set alone is impossible considering you only get 2 base cards per pack. The “Bloodlines” insert set comes in almost every pack & with 5 cards a pack, I feel its over kill considering its only a 15 card set. Plus the fighters in this insert set are not the caliber you would expect of an insert set. Also, 3 REDEMPTIONS in this case & all not even worth redeeming. If I submit them, I’ll never see them as I have 2 UFC redemptions still “Pending”. Finest & Knockouts are far superior to this set. Highly, highly overpriced. I agree with other 2 reviews of the quality of the cards. Pulled a Bisping coin card and the corners are damaged. Bloodlines is overkill and Topps should focus on Finest & Knockouts and make a quality product. I suggest going after a particular card you want on the secondary market and save your money unlike me.